It’s cold, it’s hot, it’s sunny, now it’s a downpour. What the heck do you wear in bipolar weather conditions? 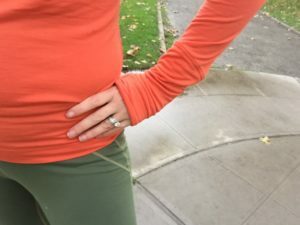 Oiselle’s newest #WazzieWool base layers are the perfect start to your layering on your next run. And the colors!!! Layers! A base layer with something easy to slip off when your body is warmed up. Not cotton. Go with performance fabrics or wool, which helps keeps dry when you get sweaty, or when the sky dumps all the rain. A baseball hat. Keeps the sun out of your eyes and the rain off your face. Reflective clothes. Those days are getting shorter, so make sure cars, cyclist and other runner can see you. Been seen, not dead. Smart about socks. Cotton socks don’t dry and the fibers expand when they get wet or sweaty, which causes blister and all around icky squishy feeties. This entry was posted in Uncategorized on October 18, 2016 by Beth Baker.